In recognition of their athletic prowess, six senior Brunswick student-athletes signed National Letters of Intent (NLI) on Wednesday. 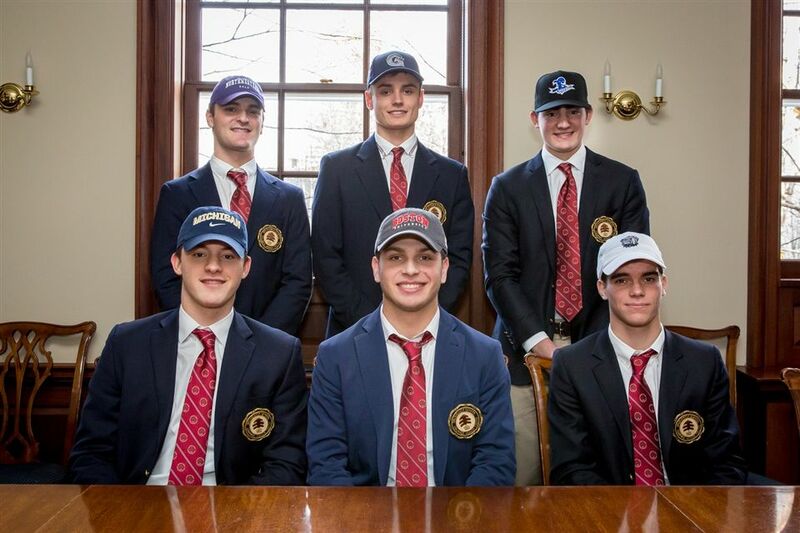 In return for athletic-scholarship aid, the six Bruins are committing to play for their respective NCAA Division I school. Both Dante Polvara and Will Sands are headed to Georgetown University to play soccer, while Matt Camel will play golf for Northwestern University, Christian Farricker will swim for the University of Michigan, Michael Gottlieb will play lacrosse at Boston University, and Reed Mascolo will play baseball for Seton Hall University. To learn more about the NLI process, click here. 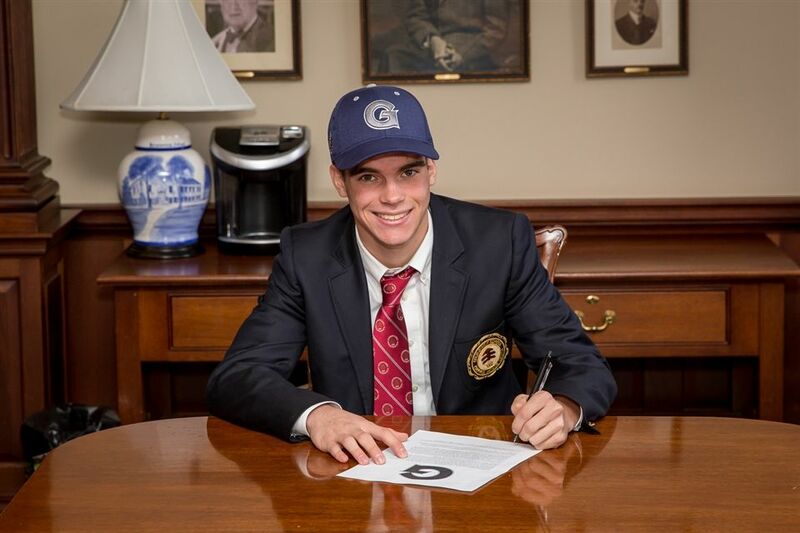 Polvara and Sands, who have played soccer together on a number of teams for the last 10 years, will keep playing together at Georgetown. Currently, both play for the academy team run by Major League Soccer’s New York City Football Club (NYCFC). This past summer, the duo playing for NYCFC won the U.S. Soccer Academy Championship in Kansas City, Missouri. 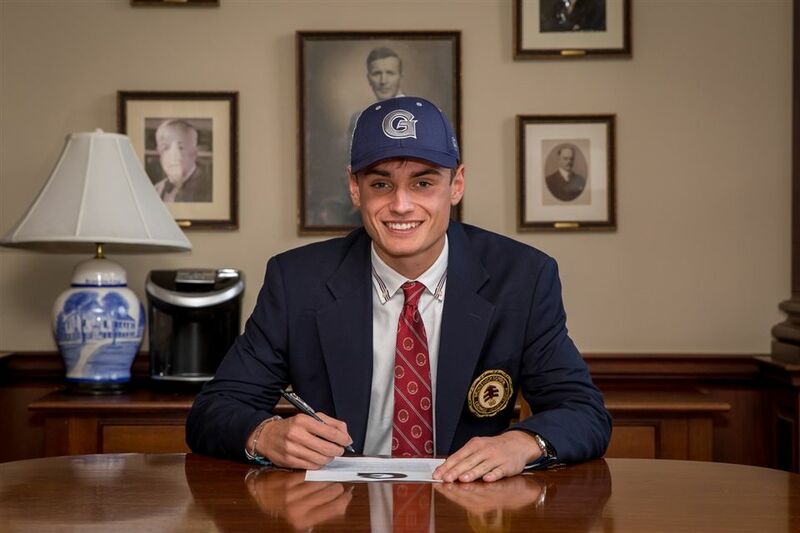 Polvara, from Pleasantville, N.Y., is a two-year member of the NYCFC academy team and also finds time to be a part-time placekicker for Brunswick’s football team. 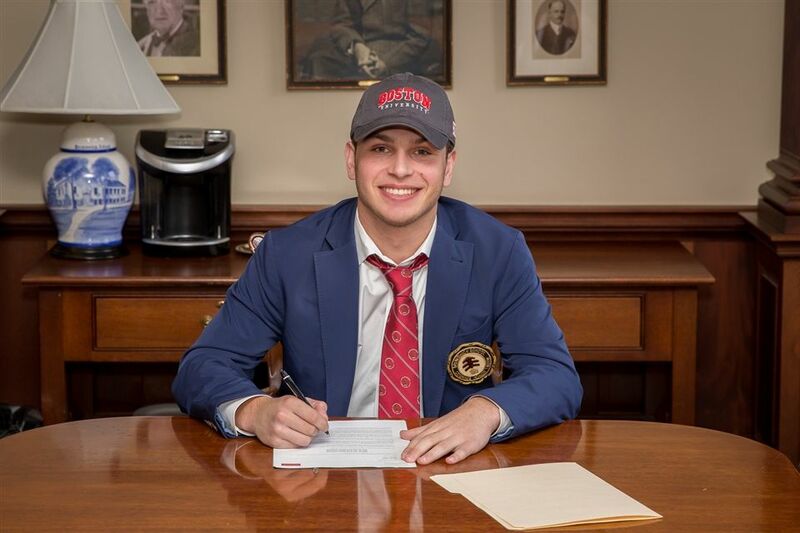 Before joining the football team, Polvara scored 15 goals for the Bruins as a midfielder on the soccer pitch as a sophomore, earning NEPSAC All-Star recognition. Sands, a Rye, N.Y., resident, was a key component for the Brunswick soccer team during his freshman year. Sands scored 10 goals back in 2015, as the Bruins qualified for the NEPSAC Class ‘A’ playoffs. Following that success, Sands was tabbed by U.S. Soccer and played on the U-17 National Team, scoring four goals in eight international contests. Currently, Sands is playing his second season for the NYCFC academy team as a forward. Camel, a future golfer for Northwestern University next season, has emerged as a top player nationally. The Greenwich resident helped the Bruins win the program’s first-ever Western New England Prep Golf Invitational this past spring. The two-year captain holds the record for the lowest score in a 54-hole American Junior Golf Association event (-19). Camel’s minus-19 earned him the title at the 2018 AJGA Circle K Junior Championship this summer, as Camel won by 10 strokes and carded a pair of holes-in-one during the three-day tournament. 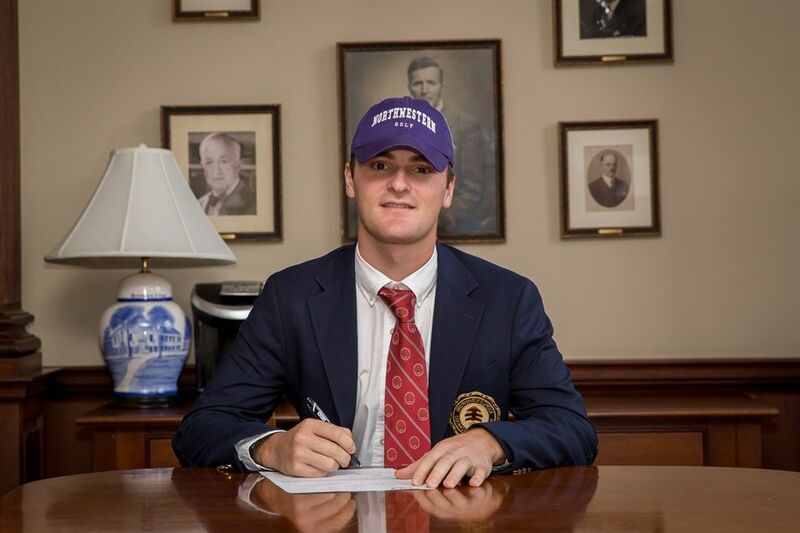 Gottlieb, a lacrosse midfielder from Rye, N.Y., will head to Boston University next fall. The speedy right-handed shooter netted 17 goals for last year’s New England West 1 Co-Champions, as the Bruins (16-1) were ranked #6 in the final 2018 Inside Lacrosse/Under Armour national poll. 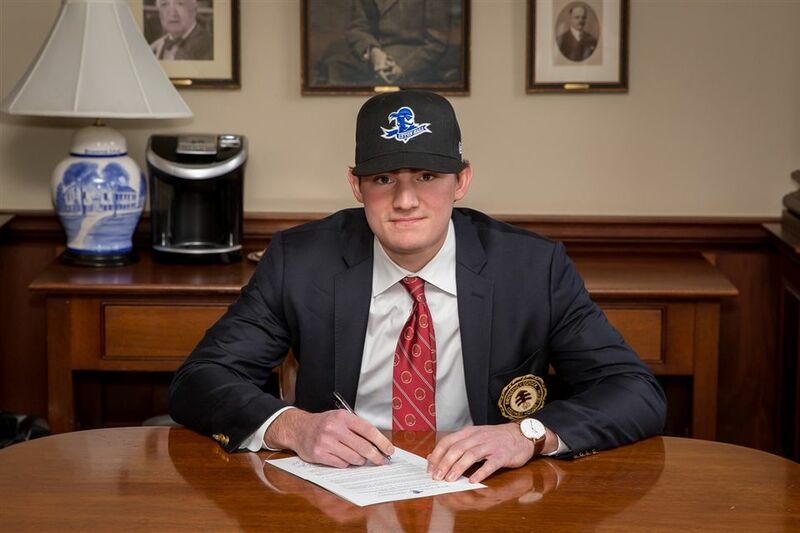 Gottlieb is also a running back for Brunswick’s varsity football team and rushed for 516 yards and seven touchdowns on 76 carries this season. Mascolo, a hard-throwing righty, keyed the Bruins’ run to the 2018 FAA Championship, as the hurler led the squad with a 5-1 record on the mound. Last season, Mascolo, who has committed to Seton Hall University, shut down RCDS in the FAA Semifinals, as Brunswick advanced to the title game following a five-strikeout performance in the 12-1 win. This past spring, the Fairfield resident made a team-high seven starts and led the 2018 FAA Champions in innings pitched (32.0). Farricker picked up plenty of accolades as a freestyle swimmer in and out of the Mehra Natatorium. 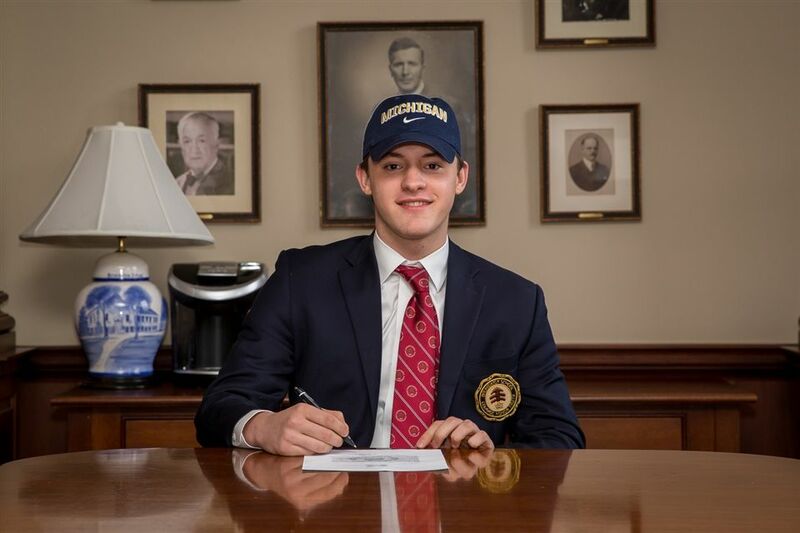 The future University of Michigan student holds five school records and three Mehra Natatorium records. Farricker is a four-time All-American and a New England Champion in freestyle races for the Bruins. Outside of school, the Cos Cob resident is a two-time U.S. Open qualifier and has five medals in YMCA National Championship events (three silver, two bronze). Farricker is also the student body president at Brunswick.